Massive and chaotic, Rome is an exciting place. It’s the fourth-most populous city in the European Union, so having our home base for the week at the foot of the city’s most famous attraction made it impossible to get lost. We found the perfect airbnb down the street from the Colosseum — so close that you could peak your head out the door and see it at any given moment, something we did often. 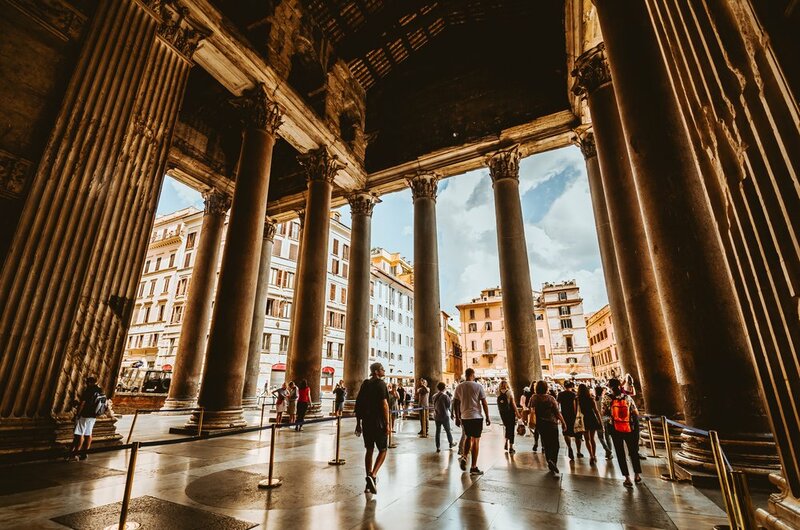 Rome's rich and exciting history spans 28 centuries, perfect for the history buff. In college I majored in history and Danny majored in the History Channel, so we were totally ready to dig in. Visits to the Colosseum as well as Vatican City are essential. 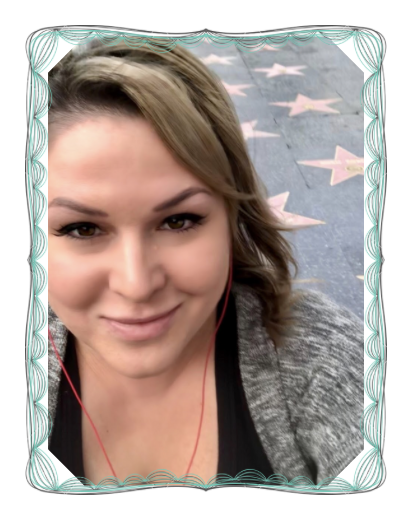 There are many different types and variations of tours available, but we went for the skip-the-line private tours which are a little pricier but offer the biggest bang for your buck. Our first tour via City Wonders covered the Colosseum, Roman Forum, and Palatine Hill. We liked our guide, Francesca and had the rare opportunity to completely clobber her with questions without worrying about monopolizing the guide. For $370, you’re free to be completely selfish tour hogs. I had no idea that gladiators were the rockstars of their day and even doubled as gigolos to rich women. 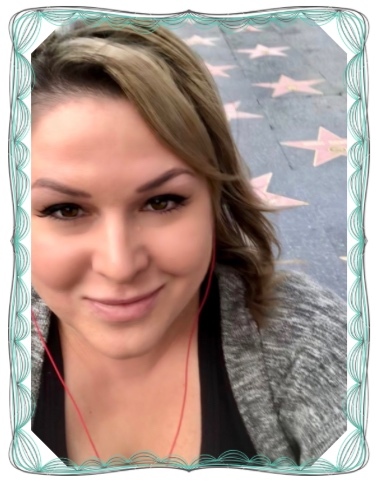 A good number of others involved were unarmed criminals or prisoners of war who were tossed in with wild animals and nothing to defend themselves. 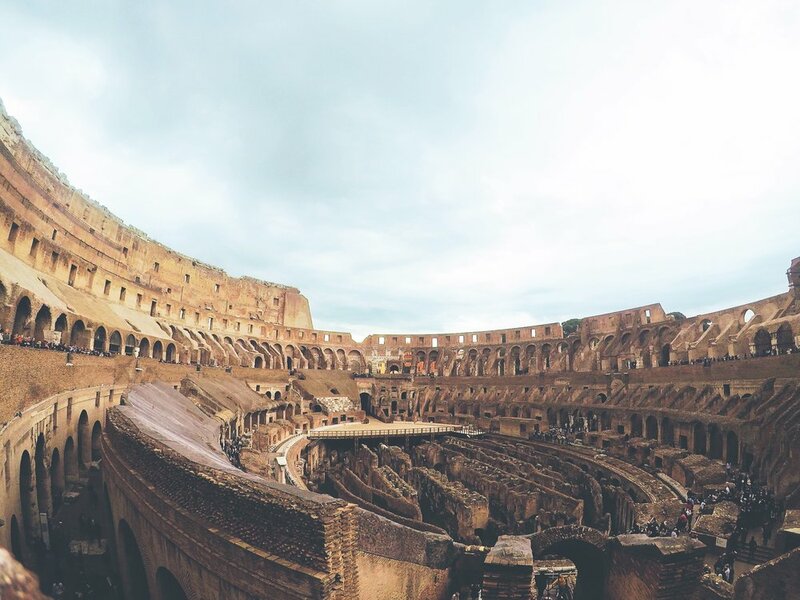 It’s one thing when you hear about the epic water battles and the array of exotic animals, but when you’re actually walking through the Colosseum’s underground attempting to visualize the realities, it’s almost too crazy to have been true. There are 36 trapdoors to assist with special effects, 80 entrances to the arena, and room to accommodate around 50,000 blood thirsty spectators. Francesca told us about the “Libitinarian Gate” otherwise known as the Gate of Death where gladiators and animals who died in battle were carried out. And then she ominously lead us through the death door to end that leg of the tour. We were ready bright and early the following morning at our designated meeting place at 7:30am. 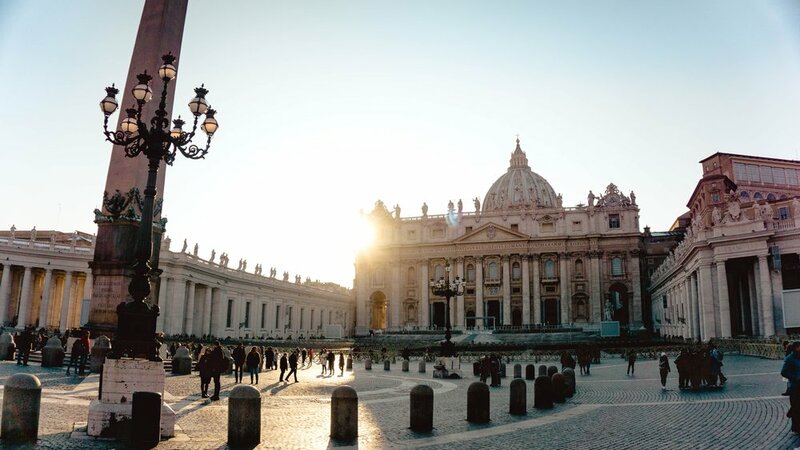 Eyes of Rome offers early bird visits to the Vatican, St. Peter’s Basilica, and the Sistine Chapel before they open to the public ($460 for 2). 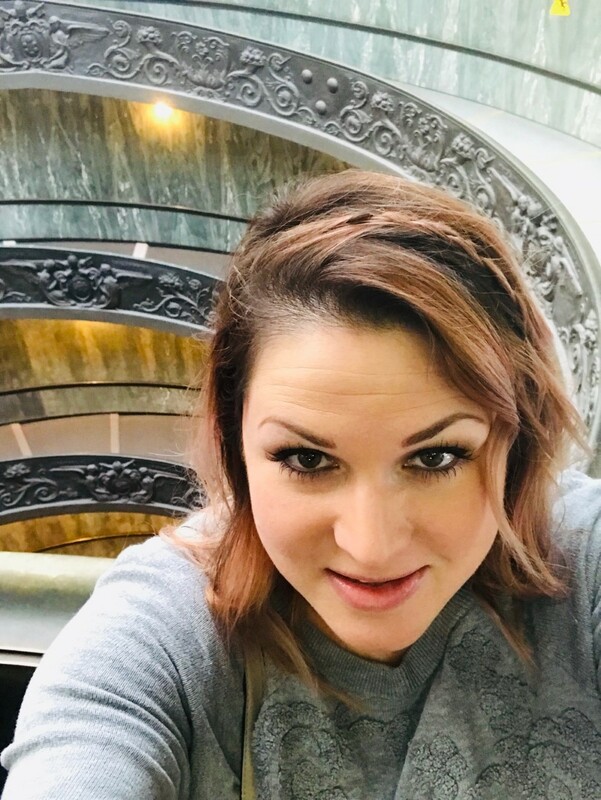 Our first stop was to take selfies in front of the famous Bramante Staircase. 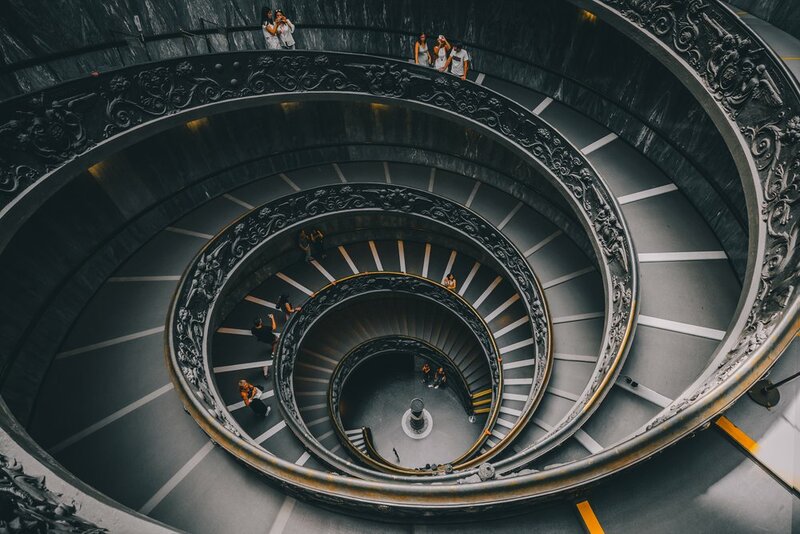 Originally designed by Donato Bramante in 1505, the spiral of stairs is a double helix with two sets of stairs so that those walking in opposite directions never actually cross paths. It’s pretty cool. What was even cooler was the freedom and personal space allowed at this hour. Laocoön and His Sons in the Vatican is one of the best known ancient statues and generally has walls of swarming people. It’s one of the earliest statues that displays human bodies in action, which had a major influence on Michelangelo and many other Italian artists. During regular hours, the wait to get into the Sistine Chapel can easily be a torturous 2 hours and once you get in, there are like way too many humans in there. Ours was not the only early tour but there were so few people, it was enjoyable to see The Creation fresco in peace. Our guide had fascinating anecdotes to share. Did you know that Michelangelo actually painted the Sistine Chapel standing up and not lying on his back as Charlton Heston would have you believe? We lucked out on both tours because, let’s be honest, a tour guide’s personality can really make or break this experience. Admittedly, hop-on hop-off buses are touristy, but I don’t know why looking like a tourist is such a crime. For the non-native, it is probably the easiest, most convenient, as well as comfortable way to see an entire city in one loop. If it’s not too cold, we love to sit on the upper level and enjoy the commentary while cruising around town. The bus can also can be used as legitimate transportation, hence the “hop-on” and “hop-off” aspect. We’ve been known to board the on/off buses in Naples, Vancouver, Paris, Nice, Florence, and now Rome, all with great success. A favorite spot where Danny and I found ourselves numerous times was the Largo di Torre Argentina. This was the most populous area of ancient Rome and the site of Caesar’s murder. 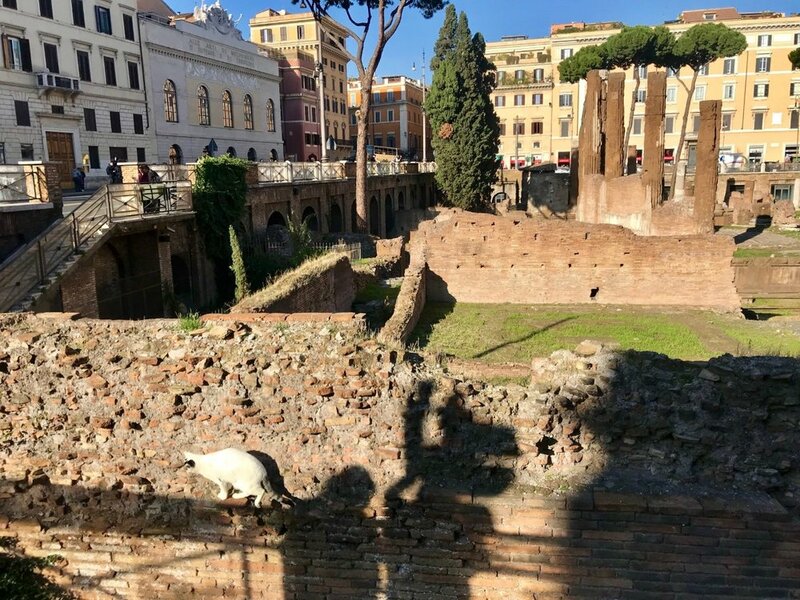 These days, Roman cats have found shelter amongst these ancient ruins and there is an actual cat sanctuary you can visit. Adoptions are available for locals, but the rest of us can opt to “adopt from a distance” and sponsor one of our new friends. 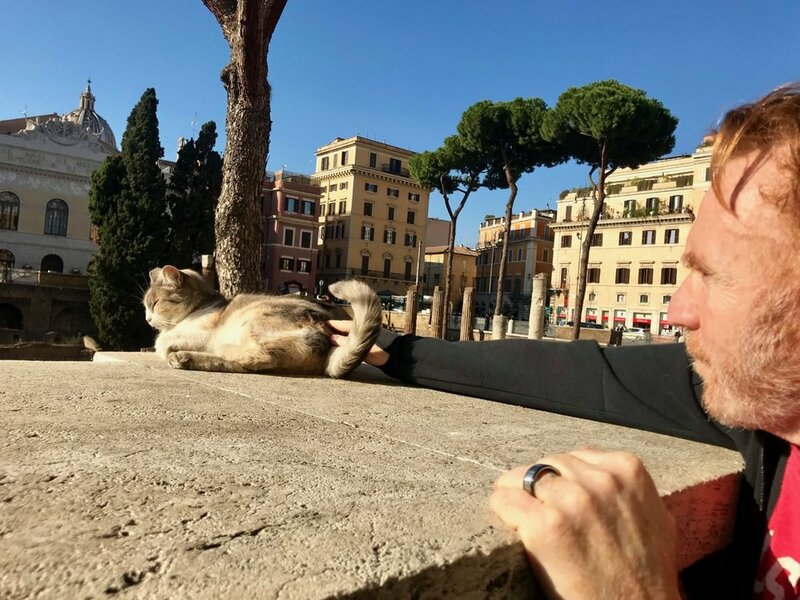 Tossing a coin over your shoulder at Trevi Fountain is a bucket list venture and you can feel good about this small expense knowing that the 3,000 Euros collected daily will benefit Rome’s neediest. If you toss a coin with your right hand over your left shoulder, it’s said that you will visit Rome again. We did the coin toss completely wrong, but this was our second trip to Rome so I guess we’re okay. 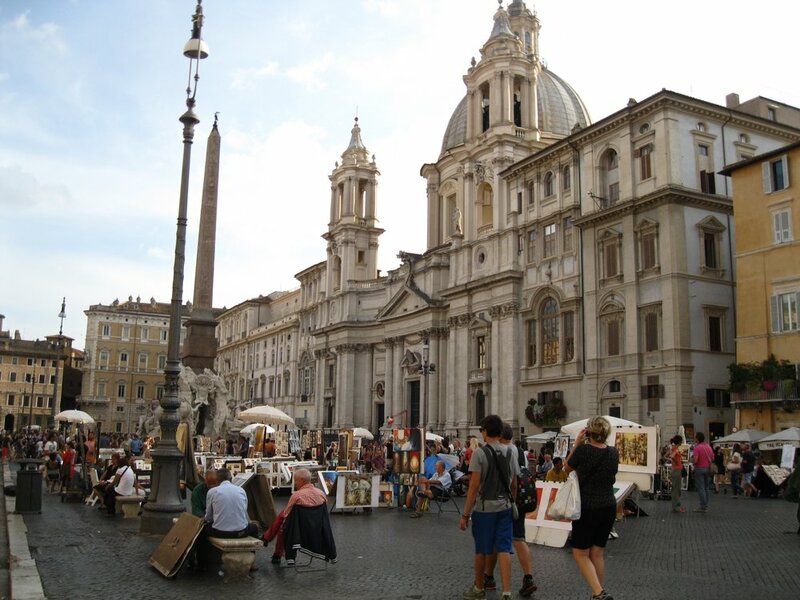 Piazza Navona, the picturesque square with artists, easels, and street performers, is worth a visit. It’s one of the most iconic plazas in the city, but be wary of the subpar restaurants preying upon those who failed to check out Yelp ahead of time. On impulse, we sat for a sketching by a street artist. He worked fast and there’s no doubt he had talent, but Danny’s likeness (if not Chuck Norris’) is much better than mine and I’m not crazy about the way he drew my nose. On our last day, we took a train about 30 minutes to Ostia Antica, which was once a bustling seaport town populated by over 60,000 people. Nowadays, the architectural site is similar to Pompeii (which is 4 hours from Rome), but with far fewer visitors. When you visit Pompeii, you’ll find an outrageous line to enter the former brothel (a must see), but in Ostia Antica, it’s all about the toilets. There’s also apartments, shops, frescos, mosaics, an amphitheater, baths, even fast food restaurants. Ostia was eventually abandoned and over time mud built up over the top of the town which kept it as a giant time capsule to be discovered and excavated beginning in 1939. We checked out the museum and skimmed through the self-guided audio tour of the town, but like most visitors of Ostia, we were hell-bent on seeing the restroom that served 24 Romans together in one room (no stalls). It’s too weird to pass up. The toilets are made from marble and if that sounds uncomfortable, know that it wasn’t unheard of for slaves to be employed as seat warmers. It wasn’t easy to find, but good news — I took a picture for you. Our journey in Rome shaped up to be a fulfilling and exhausting adventure of culture, art, and Danny taking credit for pretty much everything because he’s Italian.